I am seeing a lot of questions on Facebook pertaining to the Mad Hatters Challenge. I have taken the time to glance through and answer the questions. I think many people are asking questions but not taking the time to read through my guidelines. Please take some time and read through as I have spent a lot of time getting all of the resources available to you. I have answered most of the questions within the guidelines but I will separate it here because it seems to be getting over looked. When going to the website, you need to scroll down and review the entire document. Here is a direct link for the Challenge and Guidelines. When is the challenge due? The Entry is for a live public exhibit at Creativ Festival. For this challenge, the items must be shipped to The Crochet Crowd. Email photos are not being accepted for submissions for this challenge. The hats are being auctioned off to raise money for The Crochet Crowd Scholarship Program to give students and opportunity for scholarships. I don’t live in the USA, can I still participate? I don’t live in the USA either… we do not restrict entries to certain countries. 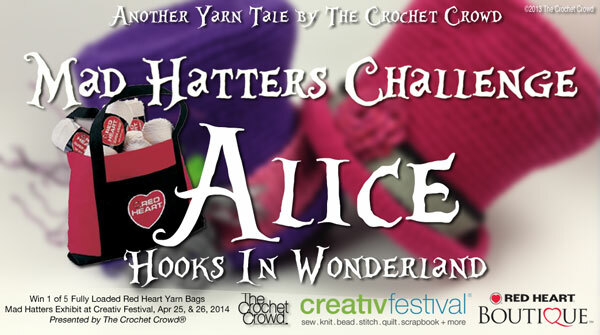 It’s been referred to as a global challenge as it’s open to all Crochet Crowd Members to participate. I don’t have Red Heart Yarn? Red Heart is amazing, though they have sponsored this challenge, you may use the yarn that you have access to. I have outlined this in the guidelines. Can you use different colours? Under the guidelines, I have stated that you can use any colours you wish. Your hats can be striped, solid or whatever that suits your creativity. You have run a challenge before with these hats, it’s not fair for those who haven’t done this before? We did a video in September 2013 when the pattern was released. There was no official challenge but viewers were welcome to show us photos for a gallery. For those who have done the pattern before, they have completed the stitch work. Most of the hats do not match the Alice in Wonderland theme. I feel it’s not fair to disqualify any one that retrofits a hat. They have done the work as a regular challenger would do. There’s 3 months to complete a hat for this challenge and I know first hand that this hat takes about 4 hours to make. What Version of Alice in Wonderland Are Allowed? Alice in Wonderland has several movies and books. It doesn’t matter which version you are using to inspire you. The point of this challenge is to tell us the story of an element within your hat that we can identify as being part of the story. We will allow “Through The Looking Glass” which is the sequel to the book. I cannot read a pattern… Will you be doing a video? There’s a video tutorial available. Refer to the guidelines link above. It’s embedded into the document. It’s also available on our YouTube Channel. The Pattern isn’t really an Alice in Wonderland Challenge? The pattern is the basic top hat… it’s how you colour it with yarn and embellishments that make the theme. The true challenge is whether you can choose your colours and embellishments to match the theme. I don’t like this challenge… will you please decide something else? I’m sorry if you don’t like the challenge… it just means you will have to sit this one out and let others take the $500 Gift Prizes. I cannot please everyone and there will always be someone that disapproves. How is the final choices being made? As stated in the guidelines, it is being judged by a panel of judges before the show. The top 10 hats will be pulled out into a featured position for Creativ Festival Guests to vote on. The final 10 hats will have Creativ Festival Guests voting on the best. The 5 hats with the most votes will win the prizes. Is the Netting, Banding, Flowers Required on the hat? No… those are optional. Just the hat itself is mandatory to follow the pattern. The accessorizing of your hat is completely up to you. Can we send in more than one entry in one box to The Crochet Crowd? If you plan on doing multiple entries, it makes sense to ship them all together in one package to save money on postage. They need to be here by April 1st and right now, it’s 3 months away… so you have time to make a few hats and get them shipped to us. There’s no rush to get them shipped to us, as long as they are here before the due date. I am not good enough to crochet so I won’t enter? Remember, this is a challenge and you have time to work on your project. The accessorizing of the hat is the fun part and probably the most critical for the judging. Remember, your hat will be auctioned off to benefit The Crochet Crowd Scholarship Program. Even if you believe yourself that you don’t have a hope to win, you may just surprise yourself and you may feel great knowing that your hat is being furthered to provide funds for the Scholarship Program. It’s a win for students, possible win for you and your creativity is showcased with 1000’s of crafters at Canada’s Largest Consumer Crafting Show. This entry was posted in Crochet Challenges and tagged Challenge, crochet crowd, FAQ, Frequently Asked Questions, Help, Mad Hatter, Mikey. Bookmark the permalink. Same question here as Donna really. I’ve looked at the guidelines and can’t see a definite answer. My hat is slightly smaller due to yarn difference, using a bigger hook would have made it floppy. If it can be ‘unintentionally oversized’ can it be ‘unintentionally undersized’? Apologies for asking I just don’t want to spend money on sending it if it’s of no use to you 🙂 thanks! I want to do the Garden Gate Afghan, I can’t find Landscape green. I have even gone to coats & Clark still I have been shut down. PLEASE HELP IF YOU CAN. Thank You in advance. I hate to pester you … I know you are busy, but I didn’t see this covered. The guidelines say we can use any yarn for the hat. What about unconventional materials (e.g. twine, wire, rex lace, etc.) for the hat itself. Is it okay to use something other than yarn, as long as the hat follows the pattern and comes out the right size? LOng as it’s the pattern and comes out the right size. Your idea sounds interesting. Someone on another board was asking if she could make the base hat and have her daughters class decorate it. I referred her here, but she wasn’t able to post the question for some reason. Is this feesible, or do designs have to be from the originator of the hat? It can be a joint effort if you wish… I think there’s another 2 ladies working on two hats and they are teaming together… to help each other conceptualize the ideas and work with each other. 😀 There’s no rule saying it has to be one person. How the prize is divided up is up to the winners. Yes… that sounds good… There’s no rule saying it has to be one person from start to finish. Daniel and I conceptualize together all the time. It helps to bounce ideas. I am new. And I am in Kuwait. How can I participate in the challenge, what can I get. And how can I send. , , when can I send. Please if you don’t mind I want to kill all the procedure. Hi there, thanks for hosting this awesome opportunity!! I am quite excited to try despite being a self taught crocheter. Although I have read your guidelines thoroughly, I am curious to find out if the entries are only limited to decorating and displaying designs on the hat’s exterior or may I have the liberty of making any designs forms as long as I incorporate the full Red Heart Yarn top hat pattern as the main entry piece? Hope to hear back from you soon!!! You can add things to the hat… the base of the hat must be the same as everyone else to be fair… how you decorate, even if you add on extra stitches and etc after the base is finalized you are welcome to do so. We just don’t want someone to do a beanie and decorate it up… What happens after you do the base is completely your call. Mixed media, accessorizing and etc… If you have another design to add to the hat, you can do so… Hopefully any of what I said just made sense. Thanks for your quick reply! It makes sense and I am super excited now. Yep… send it through regular postal services… When people send items through Courier, the processing of customs has really high duty, even when declared as a gift… with regular post services, this processing fee doesn’t exist. Declare the hats under $50 as a gift. It’s being used to raise funds for the Scholarship Program which is a gift.